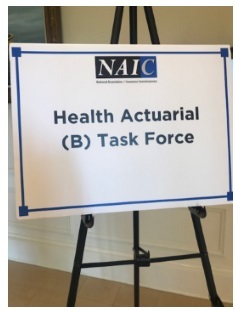 Barb Klever, chairperson of the Individual and Small Group Markets Committee, presented updates to the NAIC’s Health Actuarial Task Force on the Academy’s Health Practice Council activities. The Premium Review Work Group sent comments to the Centers for Medicare & Medicaid Services (CMS) on March 13 regarding the recently released final Unified Rate Review Template (URRT) and Instructions. Sens. Tim Kaine and Michael Bennet introduced a bill on April 2 that would create a public health insurance option called Medicare X. The bill would allow individuals to have access to Medicare and Medicaid provider networks, as well as coverage protections mandated for health insurance plans under the Affordable Care Act (ACA). In addition, the bill would provide funding for a national reinsurance program to reduce premiums, expand eligibility for premium tax credits, and allow Medicare Part D to negotiate prices for prescription drugs. The U.S. Department of Justice (DOJ) submitted a letter to the U.S. Court of Appeals for the 5th Circuit on March 25 stating its determination that an appealed ruling in Texas v. Azar currently under consideration by the court should be affirmed. That ruling, which has been stayed pending the ongoing appeal, would invalidate the entire ACA. Read the Academy alert. Following DOJ’s letter, the U.S. House of Representatives filed a brief calling on the court of appeals to reverse the lower court’s ruling. A separate brief, filed by the attorneys general of Montana and Ohio, asks the court of appeals to reverse the lower court’s determination that the parts of the ACA it found to be unconstitutional are inseverable from the remainder of the law. CMS released the Health Insurance Exchanges 2019 Open Enrollment Report on March 25, providing an overview of health plan selections made on the individual exchanges during the 2019 open enrollment period (OEP). According to the report, 11.4 million Americans selected or were automatically re-enrolled in an exchange plan during the 2019 OEP, compared to 11.8 million during the 2018 OEP. Texas legislators issued a press release on April 1 announcing that they have reached a bipartisan, bicameral agreement to address surprise medical billing in the state. The proposed legislation would prohibit medical providers from sending surprise balance bills to consumers, and would allow providers and health insurance companies to enter arbitration for payment negotiations. The Tennessee House is considering legislation that would direct the governor and commissioner of finance and administration to request a waiver from CMS allowing the state to receive funding for its Medicaid program through a block grant. CMS approved a Section 1115 Medicaid waiver request from Utah on March 29, allowing the state to extend eligibility for Medicaid coverage to working-age adults with incomes below 100 percent of the federal poverty level (FPL), rather than to those with incomes below 138 percent of the FPL as approved by voters in a November 2018 ballot initiative. In addition to expanding Utah’s Medicaid eligibility criteria, the approved waiver allows the state to implement work requirements as a condition of eligibility for certain working-age adults. The U.S. District Court for the District of Columbia issued a ruling on March 28 vacating key provisions of a rule issued by the U.S. Department of Labor to broaden the scope and availability of association health plans. Read the Academy alert. The U.S. District Court for the District of Columbia issued two rulings on March 27 blocking work requirements in the Arkansas and Kentucky Medicaid programs. The two rulings mark the third instance that the district court has issued decisions against the Trump administration policy allowing states to implement requirements for work or community engagement as a condition of Medicaid eligibility for certain working-age adults. Read the Academy alert. Georgia Gov. Brian Kemp signed a bill into law on March 27 allowing the state to apply for a Section 1115 Medicaid waiver requesting the extension of Medicaid eligibility to working-age adults with incomes below 100 percent of the FPL. New Jersey Gov. Phil Murphy submitted a letter to CMS on March 22 announcing the state’s intention to establish its own state-based health insurance exchange, which would be operational for plan year 2021. Virginia Gov. Ralph Northam vetoed a bill on March 22 that would have directed the Virginia Bureau of Insurance to apply for a waiver from the Centers for Medicare & Medicaid Services to allow the sale of catastrophic health insurance plans on the state’s individual market. The Georgia Senate passed a bill, now under consideration in the House, which would prohibit surprise billing in emergency situations by health insurers, and establish a mediation service through the Georgia department of insurance for consumers that receive bills over $1,000 for elective procedures. The Academy’s 2019 Life and Health Qualifications Seminar, to be held Nov. 10–14 in Arlington, Va. (Washington, D.C., metro area), will provide attendees the opportunity to obtain qualifications or relevant continuing education credit necessary to issue actuarial opinions for either the NAIC Life and Accident & Health (A&H) Annual Statement or the NAIC Health Annual Statement, as well as professionalism credit. Limited space is available for this highly regarded seminar. Register today. The University of Southern California’s Center for Health Journalism put the Health Practice Council’s new issue paper, Expanding Access to Public Insurance Plans, on the reading list for a March 28 webinar on “Medicare for All.” The issue paper was also cited by Healthcare Finance.